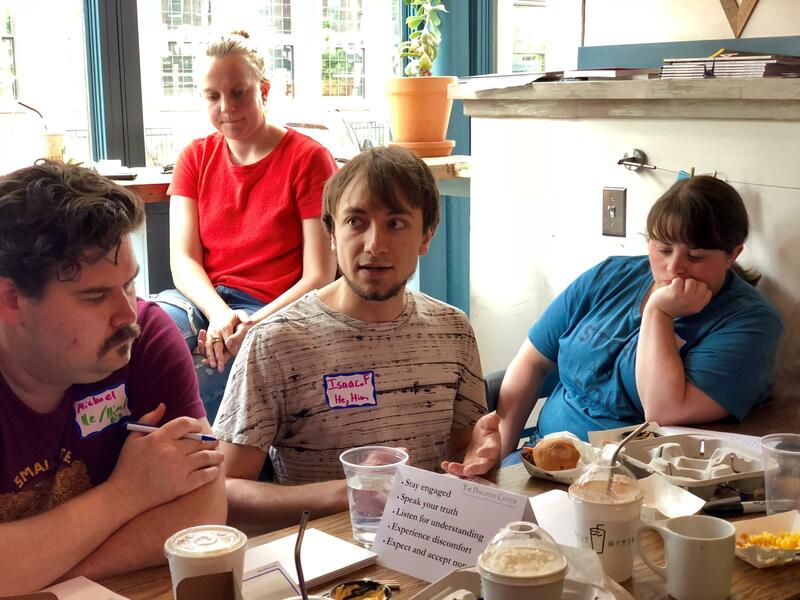 Trainer Jason Fredlund gives an anti-bias workshop to staff at Hartford's Story and Soil Coffee. 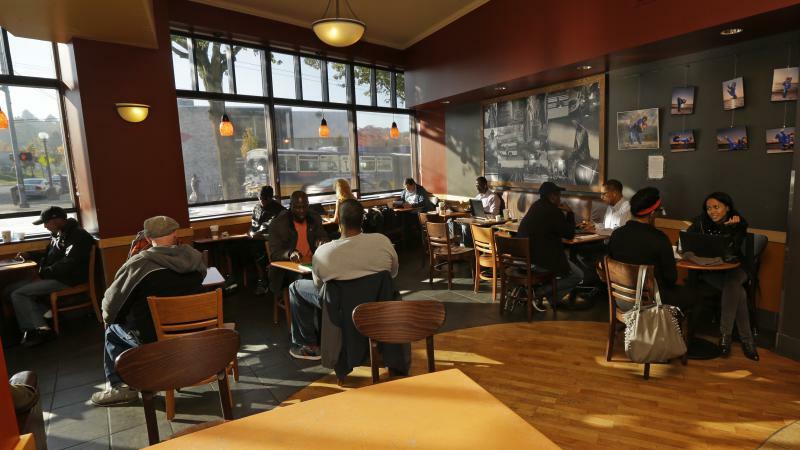 The coffeehouse owners wanted to learn more about racial bias after the incident at Starbucks this spring. 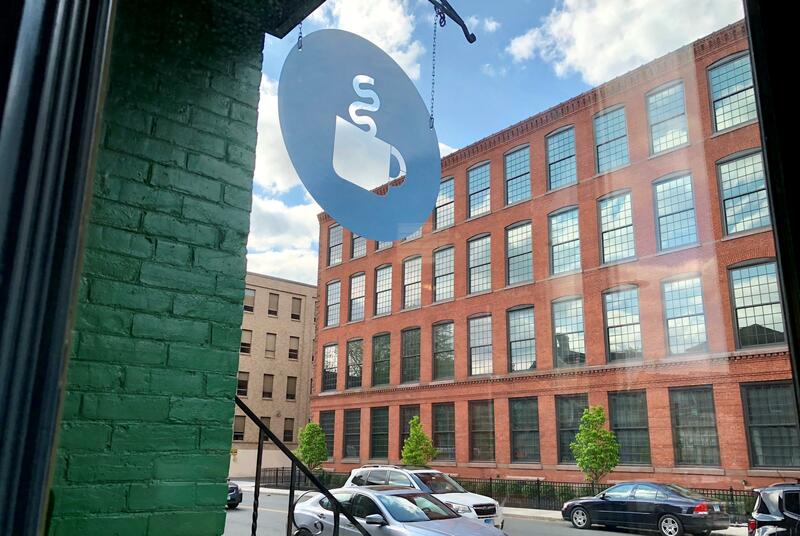 Inside the small Hartford café, co-owner Sarah McCoy explained how the incident at a Philadelphia Starbucks — the one that made national headlines and led to a companywide training on racial bias — spurred her to think more about bias in a place like this. The specialty coffeeshop with Instagram-worthy good looks opened on Capitol Avenue last summer. McCoy is white and so is a majority of the Story and Soil team. They have invited in trainers for their own anti-bias workshop on a Monday afternoon, and soon find out a major lesson: getting comfortable with being uncomfortable. Trainer Jason Fredlund, a program director with RE-Center, Race & Equity In Education, has everyone introduce themselves. He goes first. Story and Soil barista Isaac Field, center, offers his perspective during the anti-bias workshop. At left and right are co-owners Michael and Sarah McCoy. 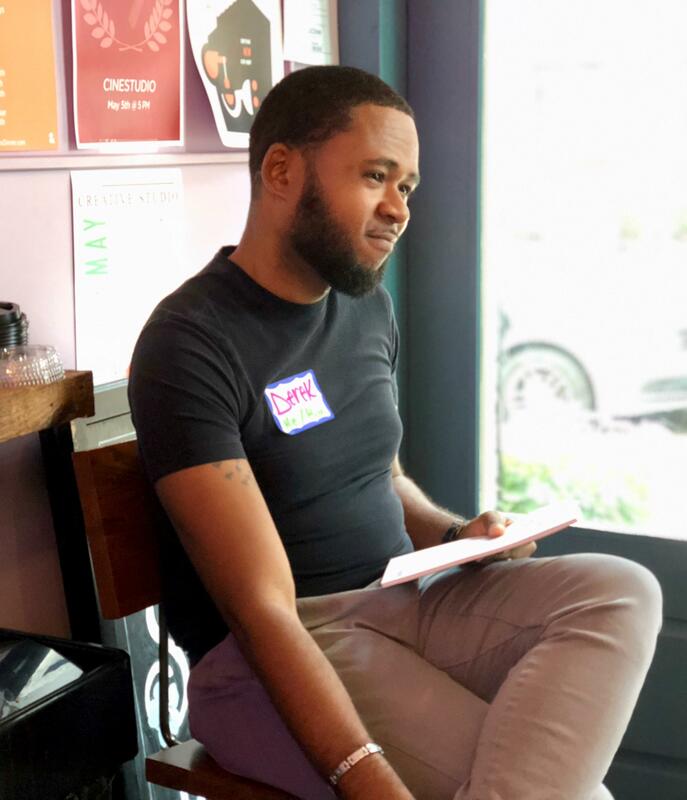 RE-Center, a nonprofit with an office in Hartford, teaches schools, museums, and businesses like Story and Soil how to be aware of everyday acts of oppression. Part of that work is understanding the power system in America — and in this society, Fredlund said, he is bestowed unearned advantages because of his race. He considers himself an example of white privilege. “Not because I did anything to earn it, but when I walk into a room, I’m assumed competent, I’m assumed worthy, I’m assumed innocent, because those are values of whiteness that get assigned to me,” he told the group. Fredlund led the training with RE-Center program director Derek Hall, who is black and grew up in Hartford. Hall said he’s gotten coffee here and appreciates that Story and Soil wants to be proactive about racial equity. Feeling “safe” in a conversation is often not the same as being comfortable, the trainers said, and they encouraged the participants to experience discomfort. Derek Hall is a program director for RE-Center. He co-led the Story and Soil training. Another barista, Isaac Field, remembered a separate occasion in which a customer was telling a story about a woman who was upset on his bus ride. But the Latino customer used a racial stereotype to describe the woman, who was black. Hall brings up another sensitive topic: gentrification. The coffeehouse is in a predominantly Latino neighborhood — and one of the co-owners is Latino — but Story and Soil sits on a block of Capitol Avenue that is transitioning into a hotspot for java connoisseurs. The café sells $4 lattes and a premium version of avocado toast on its menu. The customer base includes state government workers who commute into this part of Hartford Monday through Friday. Story and Soil Coffee on Capitol Avenue in Hartford. Across the street is a renovated apartment building called Capitol Lofts, and state government offices are down the block. “Who is likely to come to Story and Soil, and feel like, I’m familiar with this place, I understand what happens here, I feel welcome here?” Hall asked. Co-owner Michael McCoy ruminated on the question. And before answering, McCoy offered an explanation: Their fair-trade coffee beans cost more and that higher price point trickles down to the Story and Soil clientele. The two-hour session ran long, and afterward, people looked exhausted. The McCoys reiterated they want everyone to feel welcome here. And in the end, they’re left with no quick and easy solutions, but a willingness to learn and a commitment that this is the start of a journey. This report is part of the public radio collaborative Sharing America, covering the intersection of race, identity and culture. 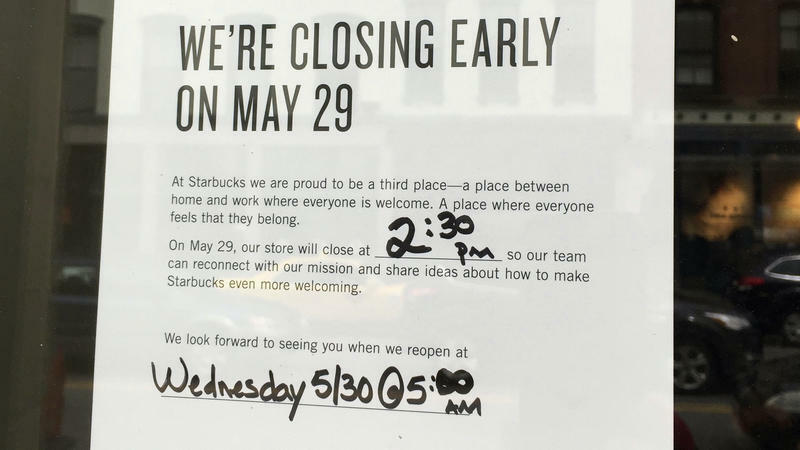 The initiative is funded by the Corporation for Public Broadcasting and includes reporters in Hartford, Conn., Kansas City and St. Louis, Mo., and Portland, Ore.
For years, Starbucks has described its stores as a "third space" — a quasi-public place, away from home or the office, where anyone is welcome to hang out. But the rules about that space are murky. They can vary from place to place, and even store to store. The way the rules are enforced isn't always consistent, either, which is how unconscious bias and discrimination can creep in. Now, the arrests of two black men at a Starbucks store in Philadelphia last week are raising uncomfortable questions for the company and others like it.